Will you sculpt a legend that deserves to be preserved? As we finally enter launch waters and put out the call for adventurers from across the globe to join us on the Sea of Thieves, let's cut briefly to a hall of legends where a familiar face – and a number of well-known names from within the community – are bringing our story into the real world. The freshly unveiled cinematic trailer for Sea of Thieves introduces us to a curator at the Museum of More Pirate, a man determined to share his lifelong passion by preserving exhibits and sharing tales of explorers and rogues who've already become the stuff of legend. Bringing an appropriate shot of charm and enthusiasm to the role is Sean Astin, known for his screen appearances in such well-loved stories as The Lord of the Rings trilogy, Stranger Things and, most strikingly for us, The Goonies. "It's unbelievably exciting for us as a team to have Sean Astin on board to help tell our story. At the start of Sea of Thieves, we explored a lot of cultural references for inspiration. One that resonated the most strongly with us was The Goonies. Many of us at Rare grew up with this film, watching a group of friends going on an adventure together in a fantastical pirate world, with a real sense of camaraderie and humour. This was exactly the spirit we wanted to capture in Sea of Thieves. "In the early stages of the project we hired out a local cinema and took the team to watch The Goonies, partly as a team-bonding session but also to immerse everyone in the film that we felt represented the experience we wanted to create and the journey we were undertaking. We wanted everyone to realise that we now had our own adventure to go on together, and if we had each other's backs, navigated the challenges and did it all with a smile on our face, we'd end up with something awesome. And here we are." You'll notice that the long-form version of the trailer also namedrops Pikaaroon, one of the buccaneers whose exploits this museum curator uses to inspire a new generation of sea skirmishers and treasure hunters. In different takes on the trailer, you'll hear tell of others: Lizalaroo and KattTruewalker. Aside from being fine pioneers of the pirate life, these three have something else in common. 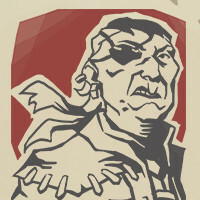 They're real people from Sea of Thieves' community, active players who you may well run into while taking on mobs of skeletons or jamming on a hurdy-gurdy at the tavern, immortalised here just as others are recognised within the game for their accomplishments now and in the days to come. So if you enjoyed the long-form version of the trailer, watch these three shorter cuts with hat tips to those other legends! For now, it's time to forge a path of your own as the new golden age of piracy unfurls. If the freedom of the pirate life and the chance to be revered by all who sail the Sea of Thieves (not to mention the spectacle of a man gamely attempting to communicate with a Kraken) haven't yet inspired you to do so, best to keep track of everything that happens from launch day onwards via our website and social channels, just to see if we can top that. Sea of Thieves arrives on Xbox One and Windows 10 PC on March 20th 2018, and is available from the Xbox Store, Windows Store, all good retailers and as part of Xbox Game Pass from day one. We'll see you on the seas!